Bates Academy and Davison Elementary-Middle are just two of approximately 90 Detroit Public Schools campuses that serve children in elementary and middle grades. These two campuses, though, accounted for victories in five of six available categories in Bridge Magazine's Academic City Championships. Kimberly Finley has been on the frontline as Bates' middle school science teacher for the past five years. She says her goals have been to make sure her students explore, learn and become inspired. Fresh-faced 13-year-old Coda Boyce is one of Finley’s science students. She just finished presenting her Science Fair Project on the “Stroop Effect,” a phenomenon that shows how the brain works when presented with conflicting problems. Finley not only teaches her students to understand important concepts and principles, such as the one demonstrated by Coda, but she also makes sure the work is presented in a current and interesting way. Not everything has to be straight out the book, said Finley, for a student to learn. Finley’s teaching style helped make Bates Academy Academic Champs in 8th Grade Science. Similar dedication helped make Bates Academy reach top city honors in 8th Grade Math and 4th Grade Reading. Christopher Holstein, Bates' eighth-grade math teacher, has taught at the school for 30 years. In addition to his 8th grade math class, where students are actually taught ninth-grade math skills, he teaches “Academic Games,” in which schools compete against each other on Saturdays. As many as 60 students pile into his classroom at lunchtime to practice, for the simple reason "they like it," he said. “Some people say that I live and breathe math -- and I do, because I know it is competitive out there and I want my students to be the best and the only way to do that is to work with them, and push them and sometimes make them do things they don’t want to do, Holstein said. South and east of Bates, Davison Elementary-Middle School posted fine marks of its own. Though almost all of its students receive free federal lunch aid -- a key indicator of family challenges -- Davison scored at 94 percent proficient in 4th Grade Reading and 98.9 percent proficient in 4th Grade Math, top marks for Detroit Public Schools. 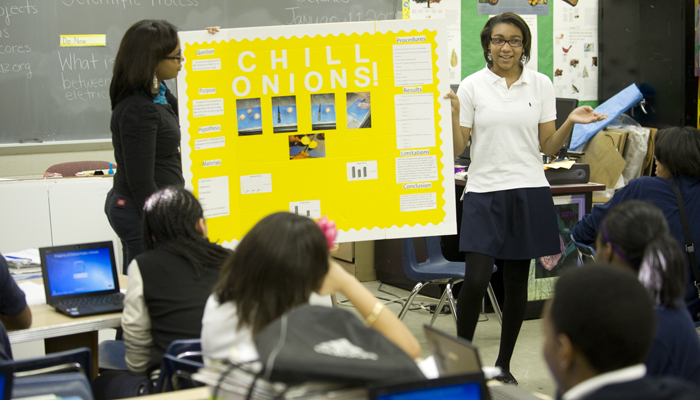 Unlike other high-performing Detroit schools, Davison does not have entrance exams or other selection processes. It's a neighborhood school serving the children in the immediate area. Principal Dianne Holland dispels the prevailing notion that low income means poor academics. Holland credits the implementation of MicroSociety, Inc., a program that brings real-life living into the classroom, for boosting Davison. Students create and run a real business, which helps put math and reading skills into practice. Bates Academy -- 99 percent proficient. Bates Academy -- 98 percent proficient. Bates Academy -- 86 percent proficient. Davison Elementary-Middle School -- 94.3 percent proficient. Davison Elementary-Middle School -- 98.9 percent proficient. Note: All results reflect testing for 2010-11 school year.